Zsa Zsa the English bulldog was the ugliest dog in the whole wide world, and she had the giant trophy to prove it. This was irrefutably established just weeks ago when Zsa Zsa won 2018 World’s Ugliest Dog competition, and she skyrocketed into canine celebrity. But now, Zsa Zsa has passed on to compete in the Ugliest Dog in Dog Heaven competition. She will be missed, and pink toenails will never be the same. Zsa Zsa passed away peacefully in her sleep on Tuesday after nine years of gracing the planet with her unique underbite. Her death was announced by her owner, Megan Brainard. 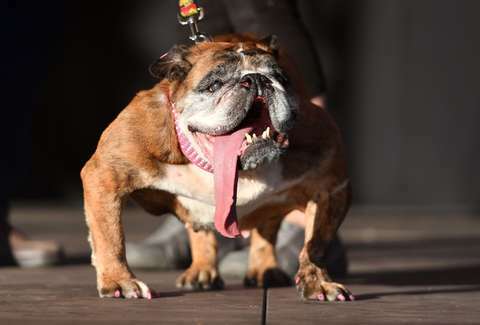 The New York Times reports that though she wasn't having health issues, the life-expectancy for an English bulldog is between eight and 10 years. "She’s been staying over at my dad’s house," Brainard told Today. "He woke up this morning and found her passed away." Something about Zsa Zsa -- maybe her astonishingly droopy tongue, or her massive shoulders, or her winning grin -- resonated with people, and her passing has brought about a New York Times obituary and an outpouring of grief on Twitter. She even got a shoutout from the 9-year-old boy who's pets hundreds of dogs. The two were scheduled to meet on Saturday, but that was tragically prevented from happening. According to Brainard, "She knew she was special."